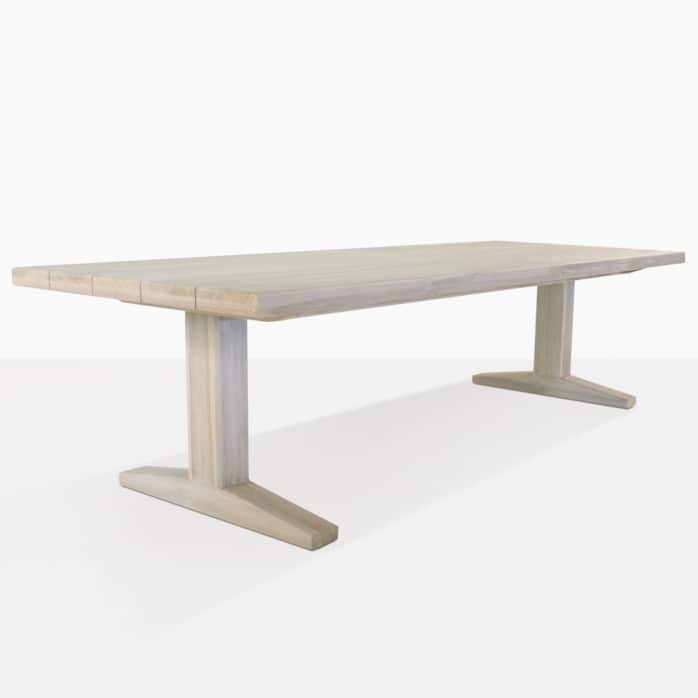 Enjoy a new type of rustic, with the smooth sophistication of the Sherman Teak Dining Table. 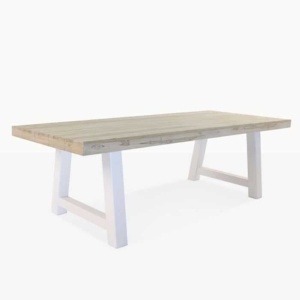 Heavy duty reclaimed teak is on show in a stunning design that blends the simplicity of modern, stylish indoor furniture with a classic outdoor look. The unique legs replicate the fine precision of French Countryside furniture from the turn of the last century while of thick panels of wood present a welcoming, large and amazing tabletop. 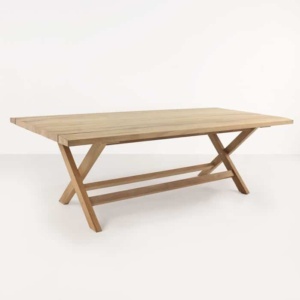 The Sherman Teak Dining Table is more than just an outdoor table; it is a communal place where hours will be spent enjoying company, good food and your beautiful environment. 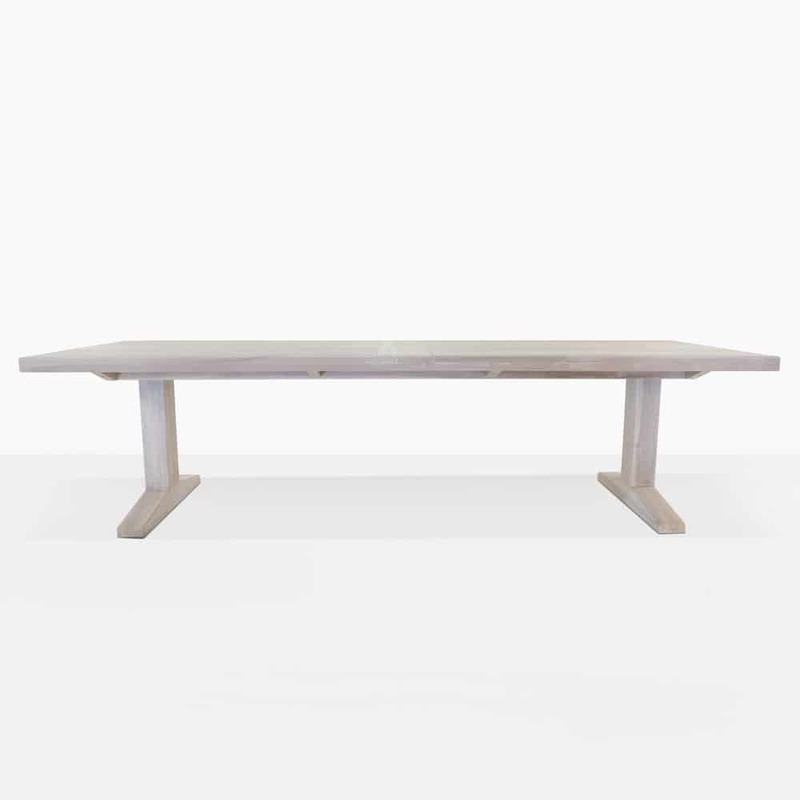 Keep it classic with the Sherman Teak Dining Table and wood outdoor chairs or benches. Perhaps you want that fabulous urban look that presents a blend of materials under a canopy for hours and hours outdoors? Place your Sherman Teak Table in the centre of your space, surround with elegant Wicker and Aluminium Dining Chairs and be sure to pick up one of our fanciful Black Sunbrella® umbrellas for overhead shade, then get ready to sit back and rejoice as your space is transformed into a chic yet friendly area for convivial chats over long lunches and congregations that go long into the evening. The Sherman Outdoor Teak Table is made from incredible material that makes it good looking as well as high quality. Teak is without a doubt the best wood for use in exterior furniture. The natural rubbers and oils determine mighty and well-built furniture that stands the test of time outdoors. At Design Warehouse, we are happy to help you find the best possible pieces to complement your Sherman Dining Table. Call us today to discuss which of our hundreds of outdoor dining chairs and benches will work best for you!